Looking for a FUN way to give back to your North County community in 2018? 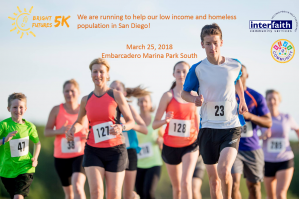 Join local non-profit Kids4Community as they host their Bright Futures 5K to help our low-income and homeless neighbors in San Diego. Proceeds from the event will benefit Interfaith Community Services. *Kids 1K “Fun Run” (ages 8 & under) will start at 8:45 a.m. This family-friendly event benefits Interfaith and will help us continue to feed our local homeless population, provide shelter, self-sufficiency and employment programs to those in need of a hand up, as well as access to transitional and permanent housing options. Kids4Community invites you to get involved by registering for the event and sharing your personal fundraising page; bring your friends and family to make a bigger difference! Register for the Bright Futures 5K by clicking here.